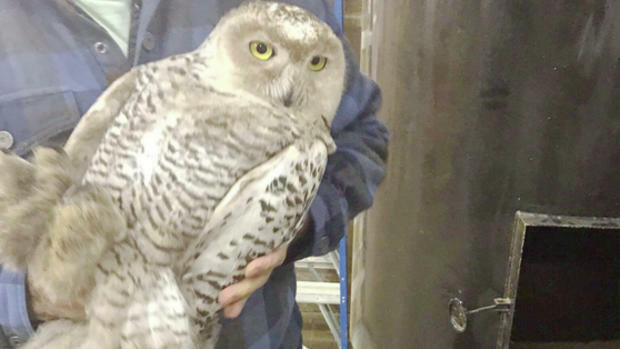 Snowy Owls are not known for their affinity to coffee, but on Wednesday, one particular Snowy Owl in Duluth had a too-close for comfort encounter with Alakef Coffee Roasters. We’re in the midst of what scientists call an invasion or irruption year for Snowy Owls. We used to attribute these years when a great many of the owls show up in the Lower 48 to crashes in the lemming population, and most of us believed that most of the birds were starving. 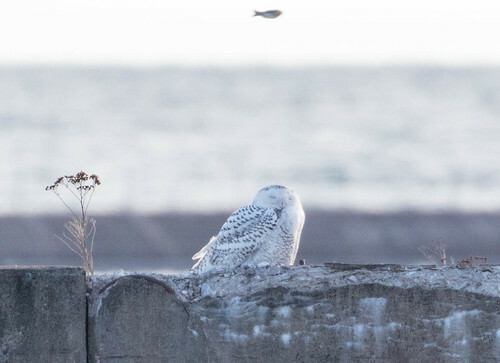 Duluth’s own David Evans banded Snowy Owls every year in the Duluth Harbor, and some of the individuals, in perfect health, returned several years running, so people paying attention knew that the situation was more complicated than that. Banders can tell by a bird’s condition and weight whether it’s actually starving. The ones taken in for rehab often are in terrible condition and down to unhealthy weights, but that is often due to those birds’ injuries making it difficult for them to hunt. When you think about it, it doesn’t make sense that a bird starving in the Arctic Circle could make it all the way through the Canadian wilderness and well into the United States—it takes a lot of calories and strength to migrate at all, much less such long distances. So during the Snowy Owl invasion in 2013-2014, Scott Weidensaul and several other bird researchers started tracking individual Snowy Owls over time by placing satellite transmitters on them in a wonderful, ongoing project called Operation SNOWstorm. Duluth’s own Frank Nicoletti has been involved in banding for the project. So far we’ve learned that at least some of the years when owls invade, it’s because there have been so very many lemmings that reproduction was extremely successful. We’re presuming that as the birds space themselves, many of them are forced out of the Arctic by so many more experienced territorial birds. Some indeed have been found emaciated and weak, but many that are trapped by banders are robust and well filled out. Obviously, the ones that are in bad enough condition to be easily captured for rehab aren’t representative of the whole in the way that the ones trapped by banders are. And it may well be that when lemming populations crash, many more birds do head out our way. But during those years, far fewer baby Snowy Owls are hatched, and to get this far from the tundra, they still must have started in reasonably good health. Once they get away from wilderness, they get a bit bewildered by the strange changes in habitat. One of the problems they’ve historically had in Duluth, and most certainly in other places, has been due to their preference for high places to roost, along with their equal preference for avoiding high deciduous trees, which aren’t part of their habitat in permafrost. Usually this isn’t a problem, and we often see them atop roofs, power poles, and other structures. Last week I saw one in Two Harbors sitting on a wall. Unfortunately, sometimes something juts above rooftops that, from the air, looks stable and flat—a chimney or other kind of smokestack. On Wednesday, a Snowy Owl perched on the smokestack leading to the chaff receptacle at Duluth’s Alakef Coffee Roasters, and whoosh! Like Santa Claus, it dropped right down the chimney. Its scratching attracted the attention of Ezra Bennett, who found it, called Wildwoods Rehab, and made a YouTube video of the rescue. Wildwoods kept the coffee-stained bird overnight and sent it on to The Raptor Center. This story of course made the evening news. I knew it had to involve a smokestack before reporters mentioned how the bird got into the coffee-making machinery. A few decades ago, David Evans, Duluth's own prominent raptor authority, had funding to mark several birds with radio transmitters. He suddenly lost the signal of one bird, and in circling the Duluth-Superior harbor area and beyond, he finally began to pick up the signal again, but searched for two days until he finally pinpointed the bird’s location, inside an abandoned hotel. The owl had apparently fallen down the chimney. Evans got permission to go inside, and then to tear down a wall covering access to the chimney, and found the owl, still alive in a pile of dead pigeon remains, where he also found one or two dessicated Snowy Owl carcasses. When he mentioned this story at a Duluth Audubon meeting back in the late 80s or early 90s, the vice-principal of a local junior high school mentioned that a Snowy Owl had dropped down the chimney of the school, and someone else mentioned the same thing happening at their cabin. Ezra Bennett said they’d be capping the smokestack at Alakef. That’s an important thing for all of us to do for any metal-lined chimney. Meanwhile, one thing the Snowy Owls might do next time they’re way, way up north is to talk to Santa Claus about chimneys. He can tell them how it’s easier to drop down them than to rise up again, which involves laying his finger aside of his nose—two specific pieces of human anatomy that Snowy Owls just don’t have.